Fivestar > Uncategorized > Did you know? 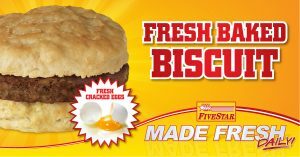 At FiveStar, we crack fresh eggs and bake fresh biscuits every morning. Our delicious breakfast sandwiches and platters are sure to get your morning off to a great start! Stop in and see for yourself!